Editor's note: This is part of a series of profiles for spring 2016 commencement. See the rest here. 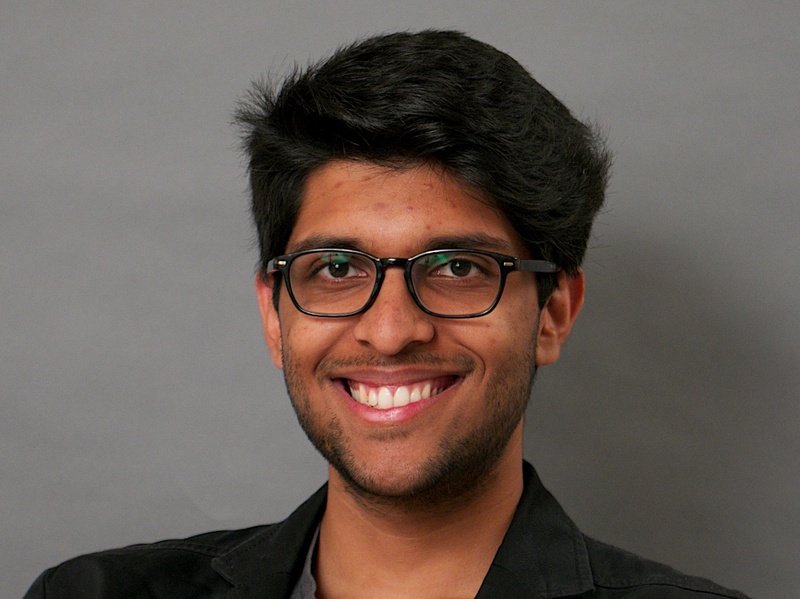 Originally from India, Dhumuntarao plans to attend the University of Cambridge in the fall to complete the one-year Mathematics Tripos (Part III) program in the Department of Applied Mathematics and Theoretical Physics before returning to the States and continuing his graduate studies at the University of Minnesota. He believes the only three things that students need to succeed are passion, ambition and mentors. Dhumuntarao understands that as a freshman or sophomore, it’s easy for students to feel that professors are the enemy or disinterested towards their education. His plans for the summer include staying in England and starting a research project with the physics faculty at Cambridge. In his downtime, he'd like to pursue personal projects, including learning French, taking courses on machine learning and studying some neuroscience. Aditya Dhumuntarao (with plaque) receives the Charles Wexler Mathematics Prize, with (from left) School of Mathematical and Statistical Sciences director Al Boggess, professor Paul Davies and professor Wenbo Tang. Dhumuntarao answered some questions about his experience at Arizona State University. Answer: I was originally a mechanical engineering and computer science student. However in the second semester of my sophomore year, I attended a physics colloquium titled, "How to Escape from a Black Hole" by my current research adviser, Maulik Parikh. This was an extremely formative moment for me. I always wanted to study mathematics and physics because their predictive and descriptive ability are, in my opinion, quite beautiful. I walked out of that lecture hall wanting to study physics and mathematics, and switched my major almost immediately afterwards. A: During the senior year of my high school, I went on a class field trip to tour Barrett, the Honors College. On the field trip, I also had the chance to tour the majority of the ASU campus. I enjoyed the atmosphere at ASU and immediately realized that I wanted to pursue my undergraduate here. Research and outreach are key, both for your undergraduate and beyond to graduate school. While conducting research places you at the forefront of your field, outreach also is a necessary part of your degree. In my case, promoting science, science education and science communication were invaluable to my desires to attend graduate school. In fact, the National Science Foundation Graduate Research Fellowship Program asked how I have positively influenced my science community. My involvement with the ASU Physics Department and TEDxASU were essential aspects of my application. Additionally, take graduate courses! Often times, the most interesting subjects or research may only be pursued after you learn an advanced topic in depth. Graduate classes are extremely helpful in this manner because graduate students often commit to an adviser after they have taken the necessary courses. Studying subjects at the graduate level not only teaches you the subject, but also important methods of study. In my case, I decided to take on graduate studies in general relativity and quantum field theory before I worked on my honors thesis, which involved studying black holes — and that's pretty neat if you ask me. If you are feeling nervous about talking to professors, joining a club or enrolling in a graduate course, just remember: Stay ambitious and you can achieve anything. A: My favorite spot on campus has to be the club room for the Society of Physics Students. I have had many fond memories there both when I was studying, or just relaxing with friends. A: I have been admitted to both the University of Minnesota and the University of Cambridge! I will join and complete the Mathematical Tripos (Part III), a one-year program, at the Department of Applied Mathematics and Theoretical Physics at Cambridge before I return to the States and resume my graduate studies at the University of Minnesota. During this summer, I am planning on staying in England and starting a research project with the physics faculty at Cambridge. In my downtime during the summer, I'd like to pursue a few personal projects such as learning French, reading history, taking courses on machine learning, brushing up on my linguistics and studying some neuroscience. A: Exploring space. While this answer seems self-contained, I chose space exploration for a variety of reasons. Other than “Star Trek: The Next Generation” being a major impact in my life, space exploration seeds the development of technologies that are invaluable to humankind. For example, technologies such as Velcro and singular advancements in water filtration can be attributed to NASA's involvement. If we want to tackle climate change, global food shortages, and improve the standards of living for all humankind — I believe the answers lie in space exploration. Originally from Quy Nhon, Vietnam, Phan did not consider mathematics as a career path early on. Getting involved in the Mentoring through Critical Transition Points (MCTP) initiative introduced Phan to conducting research as an undergraduate. He chose to focus on mathematical biology because of his love for nature and his ability to recognize patterns and connect ideas between different fields. 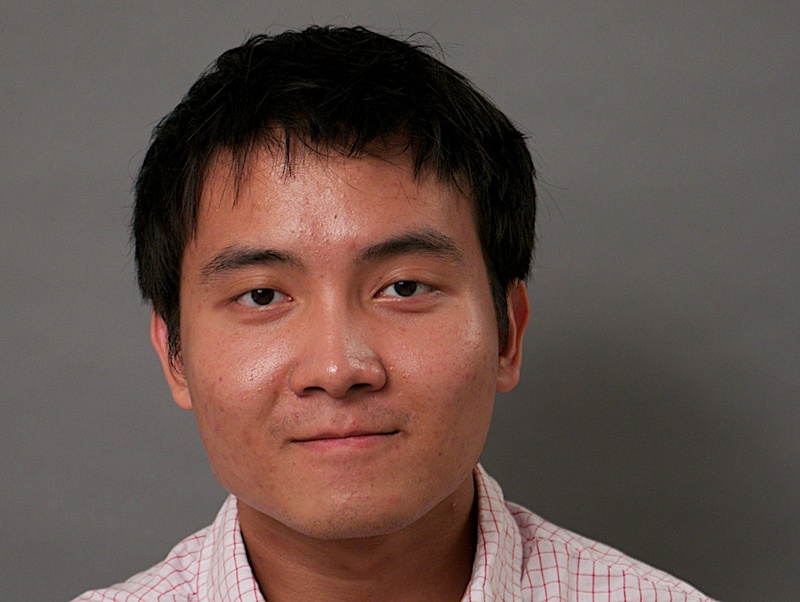 Phan met professor Yang Kuang during his MAT 475 Differential Equations class in his junior year. He considers Kuang to be his mentor and his greatest inspiration. “Aside from the mathematical and biological knowledge, he also taught me many things that cannot be learned in a traditional classroom. He is definitely the main reason why I am here today,” Phan said. After graduation, Phan plans to continue improving his mathematics skills by enrolling in the doctoral program in applied mathematics at ASU. Tin Phan (right) chats with professor Eric Kostelich and other mathematics majors at the annual Jonathan D. and Helen Wexler Mathematical Sciences Senior Dinner. Phan answered some questions about his experience at ASU. Answer: Aiming to be a mathematician is unthinkable for a vast majority of Vietnamese. In my community, being either a doctor or lawyer is the only way for a person to be considered successful. So it is natural that although I have always been good at math, I never entertained the idea that I would spend my life learning it. But mathematics finds a way to grow in me and after my long adventure to many other fields, I saw the interconnected structure of knowledge in a deeper way than simply hearing someone say it. This network is like a puzzle and I came to the conclusion that mathematics is the key to connect all the pieces. I love the impossible, so I chose math. A: Till this day, every day is a journey to a foreign land for me. In a world where winning and losing is separated by a blink of an eye, I tend to stretch my life slowly. As a result, I observe everything that happens around me and form my theory about them. There are many things that have surprised and helped me gain new perspectives while staying at such a diverse school like ASU. But the one thing that I treasure most is the realization that there are many people here at ASU who would enjoy the company of my strange humor and awkward self. A: For most of high school, I had an unimaginably difficult time communicating with anyone. By the way, that is an understatement. Thus I wanted to choose somewhere close to home so that I could reach out to others in time of difficulty. Since I lived next to the ocean (in Vietnam) for the most of my life, the temperature in my hometown never got anywhere close to 30 degree Fahrenheit. The winter here (in Arizona) felt so cold that I had to wear multiple sweaters and pants to go to school in February! So while choosing my college, ASU was the obvious choice for those reasons. Now that my English is better and I can take on the weather, if I could go back in time, I would still choose ASU. It is such a great school in so many ways. Q: Why did you decide to major in mathematics? A: I find mathematics beautiful and powerful. I have loved the subject since my childhood, but not until college, when I realized doing mathematics releases me from being worried about my own problems. It is something that I am meant to do, so I embrace it. Q: What do you like most about mathematics? A: Everything, I do mean I love everything about mathematics, and I appreciate all the great mathematicians who have contributed so much to the fields. On my part, I chose to focus on mathematical biology because of my love for nature and my ability to recognize pattern and connect ideas between different fields. Q: What do you like to do in your spare time, for fun? A: Aside from constantly running around helping others with their homework and finding resources on campus, I play chess, Go, and read comic books. A: I know what I am going to say is itself a contradiction, but this advice was given to me by people whom I have great respect for: “Do not listen to anyone.” More precisely, it means one should not take advice blindly, find his/her own path and walk on that path diligently. A: In the near future, I will be helping out with the MCTP program after graduation. Then I will attend a conference in mathematical modeling at Harvard. Afterward, I will be taking residence in the MTBI for two months and spend the last week of summer doing TA training. I will then continue improving my mathematics skills by enrolling in the PhD program in applied mathematics at ASU. Meanwhile, I will be constantly involved with mentoring and helping other students just like everything I have been doing up to now. And of course, I will also be doing research on diseases through collaboration with other amazing researchers around the world. I hope to work in something related to public health, math bio research and education after obtaining the necessary skills. A: To solve any actual problem on our planet, $40 million is likely to be insufficient. Instead, I will create an organization that will simultaneously invest the money and fund the futures of promising people. This is a naïve and simple plan, but suppose it works. Then eventually, there will be enough resources to solve any problem on our planet.